Beetles in the genus Eleodes are known as "darkling" or "pinacate beetles," and colloquially as "stinkbugs" or "clown beetles." 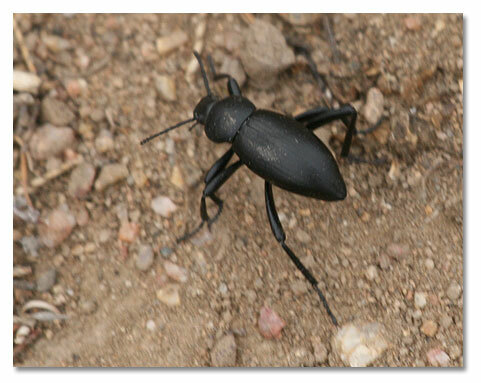 Eleodes, derived from the Greek term for "olivelike" describes the general body shape and jet black coloration. Darkling is a common name applied to several genera and over 1400 species within the family Tenebrionidae. Pinacate comes from the Aztec pinacatl, for "black beetle." Stinkbug refers to the malodorous secretion emitted from the insect’s rear end. Clown beetle alludes to the habit of these beetles to do a "headstand" when threatened. 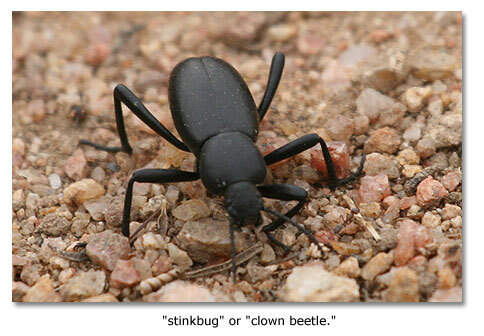 When walking, pinacate beetles, with lowered front ends and raised rears, resemble little low-riders. Bodies are ovate to oblong, ranging in size between 0.4 and 1.4 inches long, and they are jet black or occasionally dark brown. They may be smooth or rough, and elongate or robust. The head is prominent and slightly narrowed behind the eyes. A few varieties have hair-like structures and what looks like a tail, but is actually elongated wings. Like all insects, they have six legs. Thickened, leathery wing-covers protect the delicate flight wings, which they do not use. Pinacate beetles are abundant both in species and individuals west of the Mississippi. Roughly 120 species are found in the western United States. They occur across ecosystems from open dunes to shrubs to mountains. They even live on the islands off the coast of California. The greatest diversity of the largest and smelliest occur in the deserts. The greatest overall diversity occurs in scrub and mountain regions. The beetles are often found under logs or in other detritus. Most animals avoid contact with Eleodes due to the insect’s ability to produce a stinky secretion. Grasshopper mice, however, get around this problem by grabbing the beetle, jamming its behind into the sand, and eating it head first. Other predators include burrowing owls, loggerhead shrikes and another well-known stinker, skunks. One of the most commonly encountered desert insects, pinacate beetles can be active year round. From spring to autumn they are crepuscular and nocturnal (active at twilight, night and early sunrise), but come fall, they revert to a more diurnal lifestyle. Pinacate beetles are one of the great walkers of the desert beetle world and are often encountered, seemingly wandering at random. Studies have shown that they are probably in search of food, which they find by odor. Primarily, they consume detritus of grasses and forbs. In the laboratory, they eat apples, lettuce and dog food. They are well known for their comical, yet effective, defense tactics. When alarmed they stand on their heads by bending their front legs down and extending their rear legs. Depending upon the species, they exude an oily, musty secretion, which collects at the tip of the abdomen or spreads over posterior parts of the body, or they eject the reddish brown to brown secretion as a spray. Larger desert species, like E. armata and E. longicollis, can spray 10 to 20 inches. Most species can spray multiple times, if necessary. The spray is not painful unless you get it in your eyes or mouth, where it is painful, burning and temporarily blinding. It does not wash off. The larvae of certain Eleodes species are also known as false wireworms, and they are a pest of some commercial crops in the Midwest. Larvae are slender, shiny, darkish green to brown, and hard bodied. They feed on the seeds and seedlings of wheat, sorghum, all oilseeds, grain legumes and cereals, particularly in light, draining soils with a high organic content. Fine seedling crops like canola and linola are particularly susceptible.